Homeland Security: use shelter dogs! 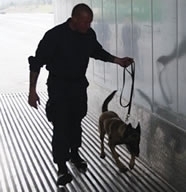 Janet Napolitano’s Department of Homeland Security announced last month that it plans to train 3,000 dogs over the next five years to help keep Americans safe. The Department is looking for Labs, Golden Retrievers, German Shepherds, and other “breeds with prior approval” to help FEMA and Customs and Border Patrol agents in their work. Great, I thought. Shelters are loaded with these breeds — many right in the age group they’re looking for: one to three years. As I read further, however, I learned that the Department is not going to enlist shelter dogs for this task. Instead they’ll pay millions of dollars to breeders to “create” what we, in essence, already have. The worst part: Only 20% of the bred dogs will qualify for the Department’s programs. That means the remaining 80% — around 12,000 dogs — will need homes, adding considerably to the number of homeless dogs already waiting to be adopted. We helped do it for Sarge. Let’s take the fight to the national level on behalf of shelter dogs across this country. On behalf of the millions of shelter animals nation wide, please reconsider your decision to contract breeders to provide dogs for Department of Homeland Security programs. There are millions of shelter dogs across the country, some facing euthanasia or months in a tiny kennel, who fit your required breed, age, and temperament criteria. Please don’t ignore the potential of these animals – according to experts, shelter dogs can be just as successful in this work as those who are bred – or the moral obligation we have to them. They deserve the chance to not only serve our nation, but to live. On behalf of the millions of shelter animals nation wide, I kindly ask you to urge Department of Homeland Security Secretary Janet Napolitano to reconsider her decision to contract breeders to provide dogs for Department programs. There are millions of shelter dogs across the country, some facing euthanasia or months in a tiny kennel, who fit the breed, age, and temperament criteria required for such training. Please don’t ignore the potential of these animals (according to experts, shelter dogs can be just as successful in this work as those who are bred) or the moral obligation we have to them. They deserve the chance to not only serve our nation, but to live.